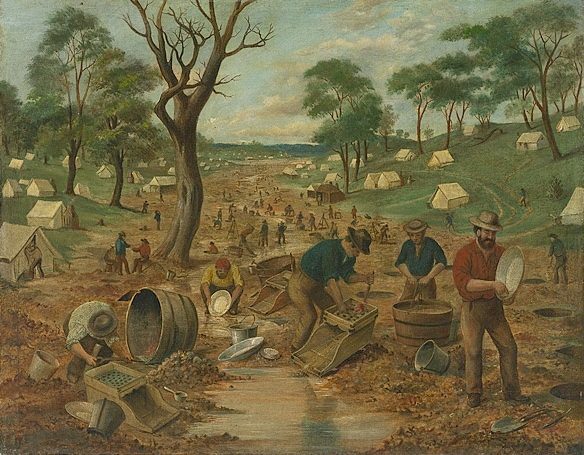 Australian prospectors struck gold on 12 February 1851. Minor discoveries of gold were made in Australia in the early days, but it was the Californian goldrush of 1849 which sharpened interest. A tough brash mountain of a man named Edward Hammond Hargraves returned from California to try the prospecting skills he had acquired there. On 12 February 1851, he and a young fellow named Lister were working along Lewis Pond Creek near Bathurst in New South Wales, where his instincts told him he was surrounded by gold. Filling a pan with the gravelly soil and sluicing it in the creek, he saw the glint. ‘There it is!’ he cried, or so he later recalled. ‘I shall be a baronet, you will be knighted and my old horse will be stuffed and put into a glass case and sent to the British Museum.’ None of these predictions came true, but word quickly spread and in April Lister and another man made a rich strike nearby at Yorky’s Corner. Hargraves, who took a proprietary interest in the whole phenomenon, christened the place Ophir, after a fabled gold-producing region in the Old Testament. The local paper, the Bathurst Free Press, prophesied ‘a complete social revolution’ in Australia, and was not so far wrong. By May, half of Sydney seemed to have left for the goldfields and there was a sensation in July when the Kerr Nugget was found, a whole hundredweight of gold. In August fabulously rich fields were found in Victoria, in the Buninyong Ranges near Ballarat. By the end of the year ships were on the way bringing hopefuls from Britain, many Cornish, Scots and Irish among them. Prospectors came from the United States and China as well, with a few from Germany and elsewhere. In London, even the young artists of the Pre-Raphaelite Brotherhood considered joining the rush to Australia, though they decided not to. Arriving at Melbourne or Geelong, the prospectors walked to the fields, each loaded down like a human mule with a tent, blankets, tools, cooking pots and a supply of flour, tea and sugar. Some of them pushed their belongings in wheelbarrows. The fields were honeycombed with diggings, each with a mound of spoil, and dotted with the diggers’ tents or lean-to huts of poles and bark. Along a rough main track would be shops, grog shanties selling spirits, and amusement halls, built of canvas or calico on a wooden frame. Prices of food and necessaries rose to astonishing heights. At the richest fields there were houses, hotels and dance halls, built of wood. The main recreations were drinking, gambling and dancing. Dance girls were in short supply and hairy diggers in pea jackets and boots, their pipes in their mouths, would dance solemnly together on a floor thick with mud. Stage shows were popular and Lola Montez’s sensuous ‘spider dance’ was a sensation in the goldfields in 1853. Diggers who struck it rich might whoop it up in the bars and theatres of Melbourne, lighting their pipes with five-pound notes and treating everyone to drinks. One man filled a horse-trough with champagne and offered every passer-by a free swig. Within ten years the population of Australia doubled. The first arrivals were mainly young men in search of a quick fortune, and the diggings were wild and lawless, but the prospectors were followed by business and professional men, traders and skilled craftsmen, who changed the nature of immigration to Australia. They brought with them middle-class standards, and often wives and children. Yet courage, resourcefulness, friendliness, helpfulness and good humour were qualities admired in the goldfields, while Old World social distinctions meant nothing. There was a democracy to the quest for gold which helped to form the Australian spirit.